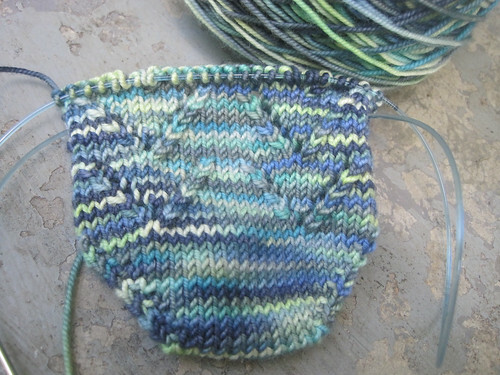 Well this is pretty much the extent of my knitting progress for the last 4 days. Pathetic huh? Oh well, it is a nice project to work on in the evening while I watch Criminal Minds season 4, and I love this yarn. I usually only have time for one episode a night and by then it’s getting to be my reading time, so yeah, knitting time is minimal right now. That’s just how it is when we are in the midst of dyeing yarn for the upcoming season, on top of school work, household duties, and various business and accounting deadlines. Speaking of dyeing, we have spent the last two days getting the yarn and dyes prepped for a big batch of solids. We will take Sunday off since I make it a practice to do that unless I am at a show. We will probably get it all done on Monday and Tuesday, so if I have time I will get some pictures of the process and share them here. I have been branching out some in my music lately. I was a pre-teen in the late seventies and was in my teens and twenties in the eighties, so that formulated the type of music I was drawn to. I wasn’t into the pop, new wave and punk of the times. I lean more towards the AOR, pop metal, and bluesy rock. Towards the end of the eighties and early nineties I was knee deep in little children and babies and kind of fell away from listening to music for awhile. Also at that time the music was starting to shift towards the grunge stuff and being out of the loop with pop culture I didn’t really know what was going on. I would turn on the radio to the rock station I had always listened to and thought what the heck happened to rock and roll? I just stopped listening for several years. At that time in my life I also had basically zero disposable income either, with which to buy albums so I only had the small collection I had acquired in my teens and early twenties. So fast forward up to the last and the present decade and the easy access to music and portable MP3 players. I bought my first iPod in 2008 and was in heaven. I now have a bit more disposable income, more than I have ever had in my life actually, and most of it goes on my electronic gadgets, books and music. Anyway, so I commenced to buy all my old favorite bands albums and pretty much stuck to what was familiar to me. Lately though I have begun to develop an appreciation for some of the bands from the nineties that I missed out on at the time. I first discovered how much I really like the Foo Fighters and branched out from there to Nirvana, Soundgarden, Finger Eleven, Pearl Jam, etc.… I can’t believe that I thought I didn’t like this stuff before. I still love all my old favorites too like Rush, Def Leppard, Reo Speedwagon, Led Zeppelin, Journey, Tom Petty, etc. What about you? Do you have favorites that you would recommend?